I am finally getting better at cooking beef. Up until the last year or so, I seldom cooked beef at home. Going out for a date night at our favorite steak house was a treat, and I never felt that I could prepare beef at home that lived up to the tender, juicy steaks we had from out, so I avoided it. 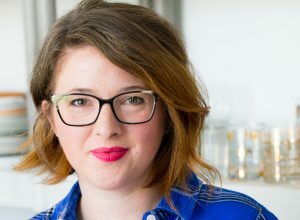 And let’s face it, beef is expensive – as are most meats these days, so feeling like I was wasting money by drying out beef did not make me reach for it often while meal planning. Since starting Jelly Toast, I have slowly increased my knowledge of cooking beef, here and there. 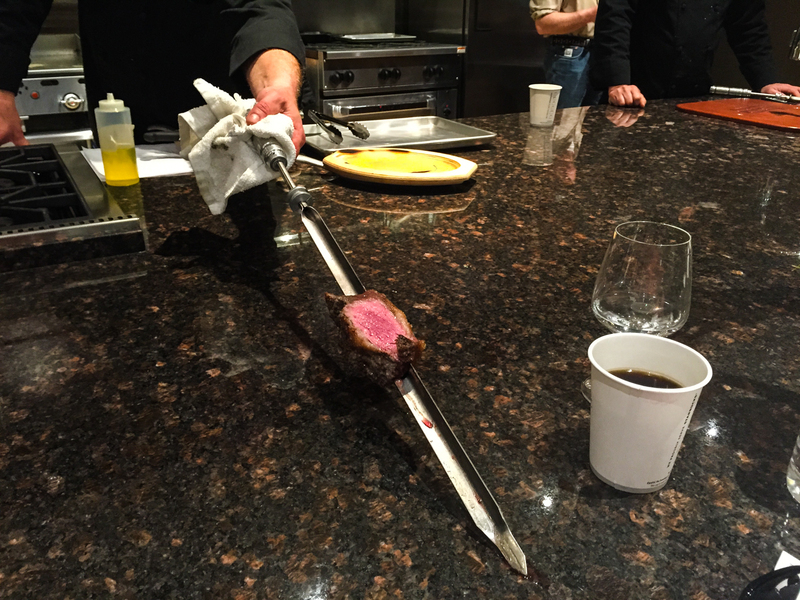 However, it wasn’t until last Spring when I was hosted by the generous team at Certified Angus Beef® on a trip to their facilities in Wooster, Ohio that I ultimately shed my fear and intimidation of cooking beef. It turns out that armed with some knowledge of how to choose the proper cut for the intended preparation as well as how to properly cook economical cuts and have them shine, I finally reset my mentality and began to turn out some incredible beef recipes. This Fall, Certified Angus Beef® has released a new app (which I have on my iPhone and iPad – yay!) called Roast Perfect. I have played around with the app several times, most recently challenging it to direct me to cook an Eye of Round roast – which is one of the most economical and lean roasts that is available at my grocery store. 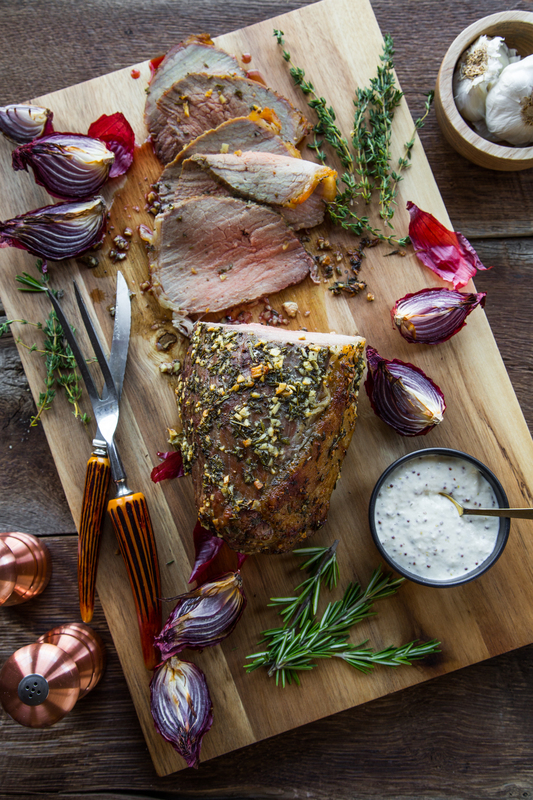 The app itself is equipped with full recipes for a variety of popular roast cuts, from celebration rib roasts to more economical cuts like this eye of round. But, being the food blogger and experimenter in the kitchen that I am, my favorite part of the app is the roast timer. This section of the app allows you to choose the roast cut, poundage, and desired doneness. It then gives you specific directions on how to properly cook that roast properly – regardless of how you season it! This is more of a set of cooking guidelines allowing me the freedom of creating the seasons and flavors that I see fit. In the photo above, you can see the steps that the app laid out for searing (450° for 15 min), roasting (325° for 1 hour and 12 minutes), and then tenting with foil for 10 minutes. After rubbing my roast with garlic and herbs and allowing the seasonings to sit on it overnight, I followed the roast timer exactly. What resulted was the most incredibly tender medium rare garlic herb roast beef that has ever come out of my oven. I could not stop nibbling at the pieces. My family ended up eating it on sandwiches for dinner with a generous dollop of the simple horseradish mustard sauce. Is it weird that I feel like a superhero with the Roast Perfect app as my sidekick? That’s an odd image, I admit, but knowing that I have this tool that will help me to cook roasts perfectly – particularly getting into prime roasting season – has me flat out joyous. You may remember that I have mentioned Certified Angus Beef in the past when discussing my Beef Breakfast Sausage and my Slow Cooker Bloody Mary Pot Roast. 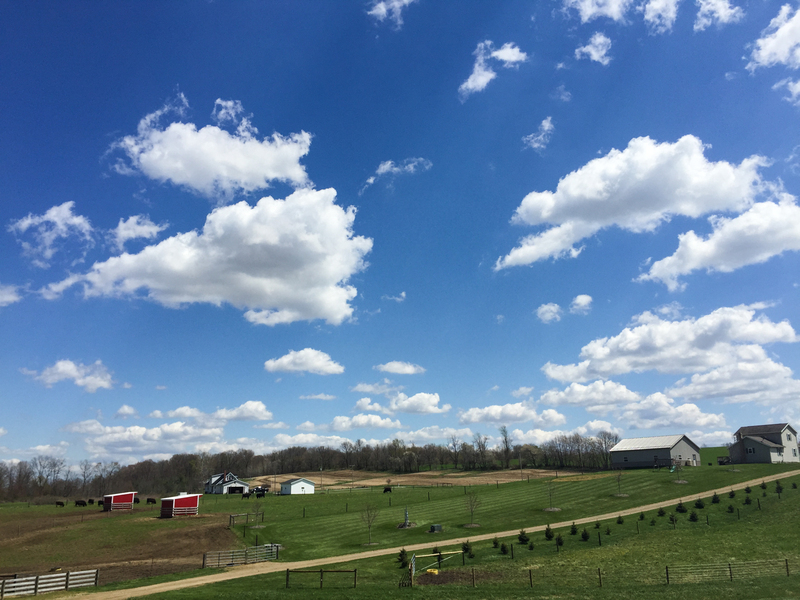 During my trip to Wooster, Ohio, I learned so much about choosing cuts of beef for different recipes. Having never been to any formal culinary classes, I really appreciate any chance I can get to learn from experts about food and cooking. We had a long session with Dr. Phil Bass who was beyond knowledgeable. 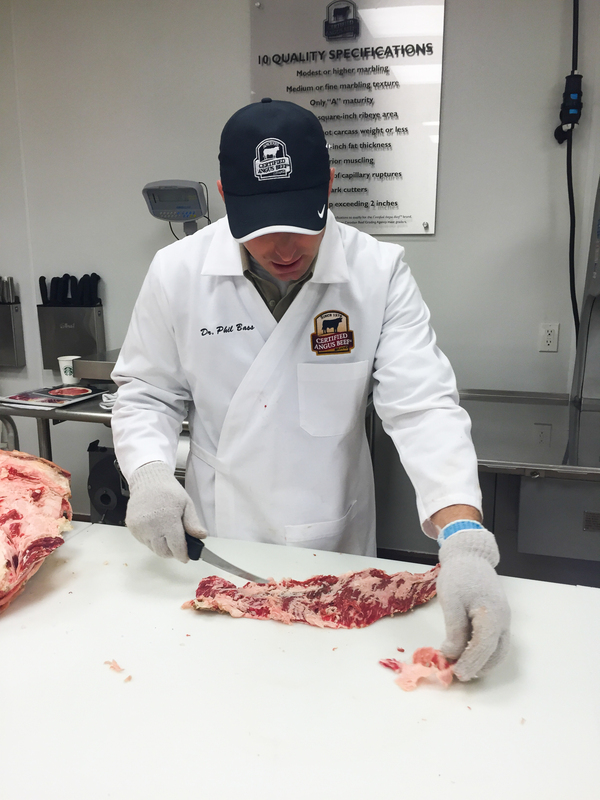 I was able to help break down a beef carcass and see first hand where many beef cuts come from. What made this experience extremely unique was that there were several chefs, including Chef Peter (below), working nearby to quickly cook some cuts for as shortly after they were broken down. 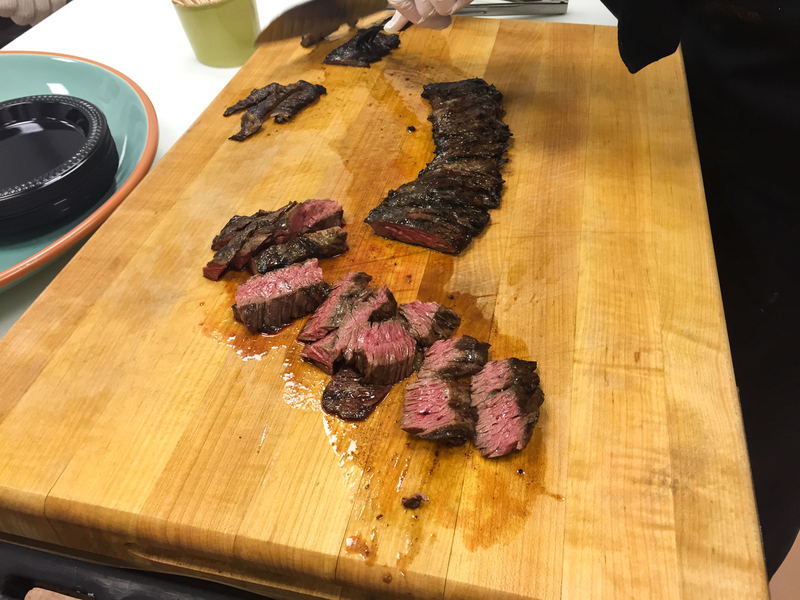 This is a skirt steak that Dr. Phil Bass broke down and below you can see the same steak cooked simply with salt and pepper by Chef Peter. I am challenged to recall a more delicious piece of beef. 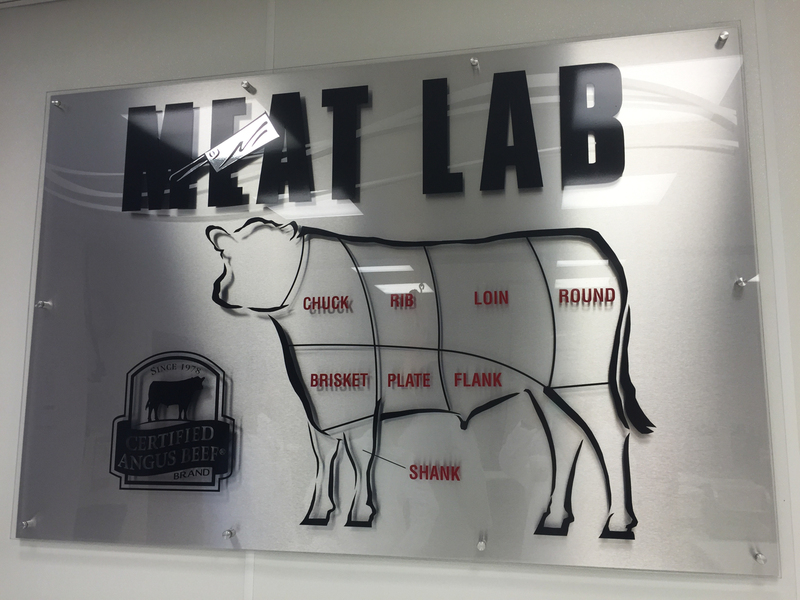 One of the main points of the trip was to share information about the Certified Angus Beef® brand. I had seen beef with their sticker at my local Meijer store many times, but did not fully understand what it meant before this trip. The brand itself owns no cattle, however, they own their branding. 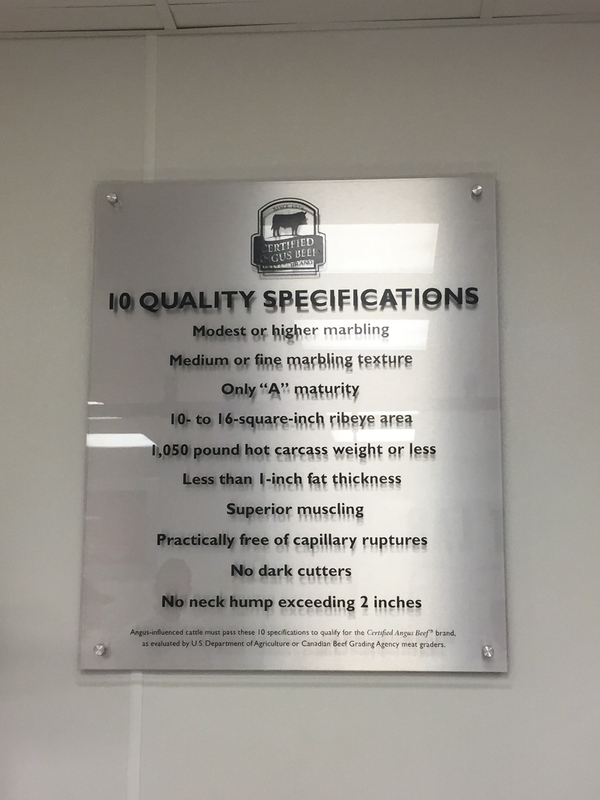 They have a set of 10 qualifications (seen below) that will determine whether or not a cattle can be classified as Certified Angus Beef. So what does this all mean when it comes down to it? Certified Angus Beef has these qualifications because they have found that beef that meets these qualifications is almost gauranteed to provide a great eating experience. The marbling found in CAB cuts is perfection and is the type of marbling that will melt into the beef during cooking, basting it and ensuring a moist and tender outcome. Since switching entirely to CAB in our home, I have had incredible luck with preparing beef. Starting with a high quality beef, whether it’s an expensive cut or a more modestly priced roast, is important to having success in cooking. Our group had the pleasure of meeting CAB’s team of chefs and see their passion for what they do. They had genuine pride and pleasure in working for such a wonderful brand and it was contagious being in their presence I am still no expert when it comes to cooking beef, but I have made serious strides in understanding what it takes to cook beef and cook it well. If you are interested in learning more, I encourage you to visit the Certified Angus Beef website and find them in Instagram, Facebook, and Twitter. They are also on Periscope, if you are on there, and often have fun live streams. Seriously, the CAB team is so much fun. 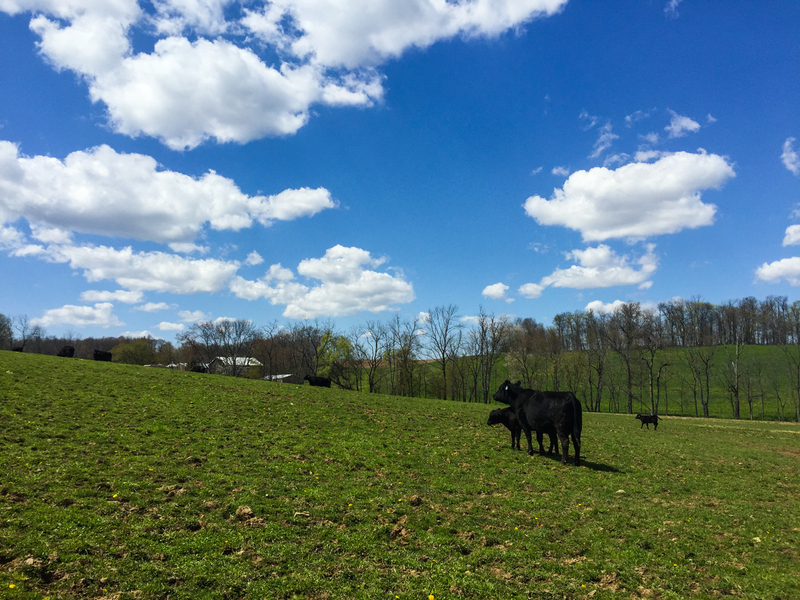 If you are not sure where you can purchase Certified Angus Beef near you, check out their store locator for help. 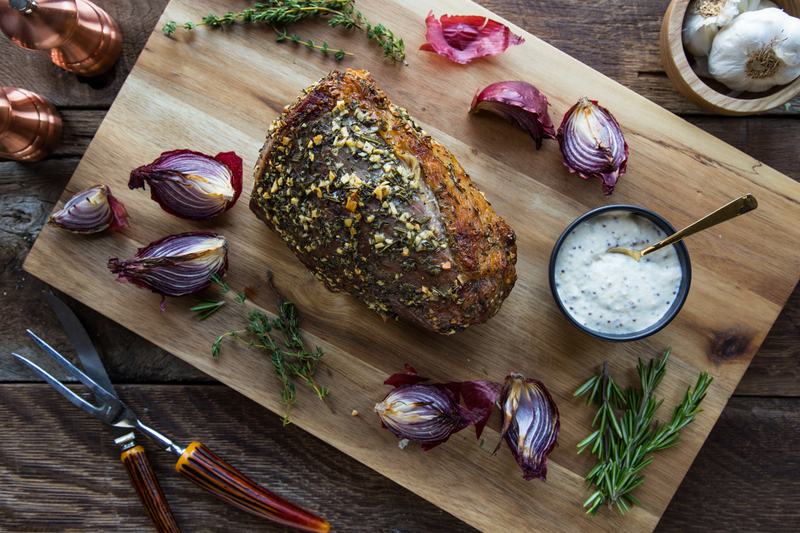 The garlic herb rub that I used on my Eye of Round roast would be fantastic on any cut of beef that you are looking to cook. Just adjust amounts accordingly if using a larger roast. Now I am off to eat another leftover roast beef sandwich! 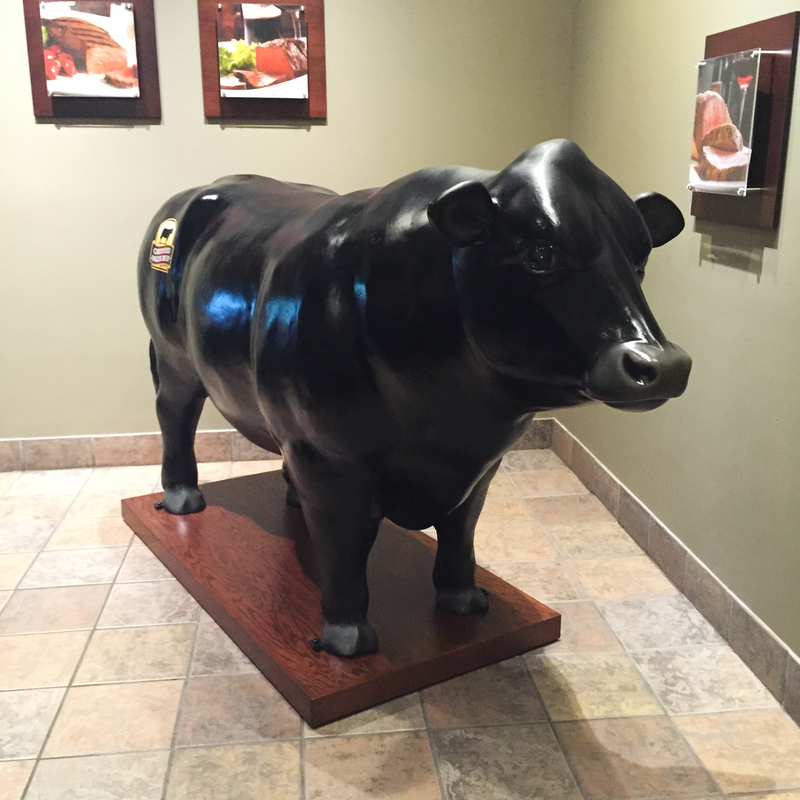 Disclosure: I was invited by Certified Angus Beef® brand to attend a media trip back in the Spring of 2015. 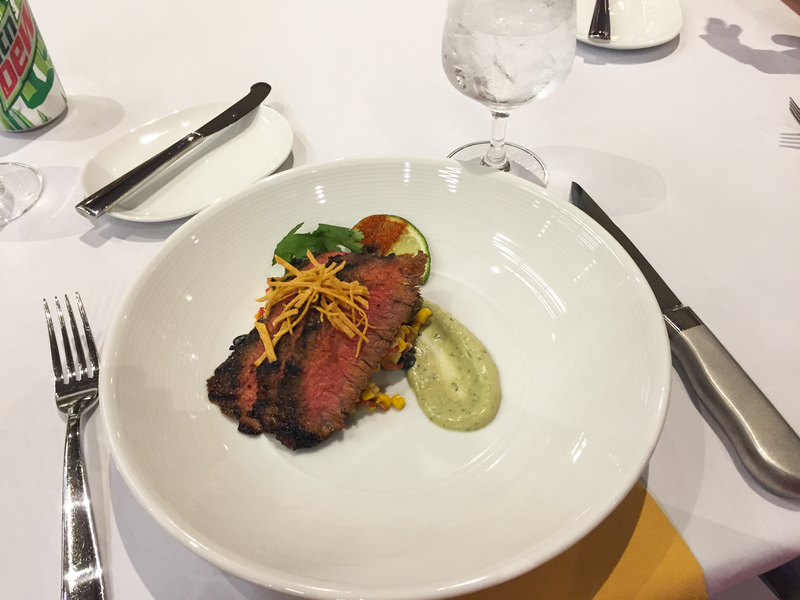 I was hosted on that trip to learn about the Certified Angus Beef® brand and about cooking beef in general. I did not receive compensation for this post. All opinions are completely my own. Mix together olive oil, garlic, herbs, salt, and pepper in a small bowl. Massage the mixture into the roast, covering the entire outside of the roast. Wrap the roast in plastic wrap and place in a shallow dish. Refrigerate roast over night or at least for 4 hours before roasting. 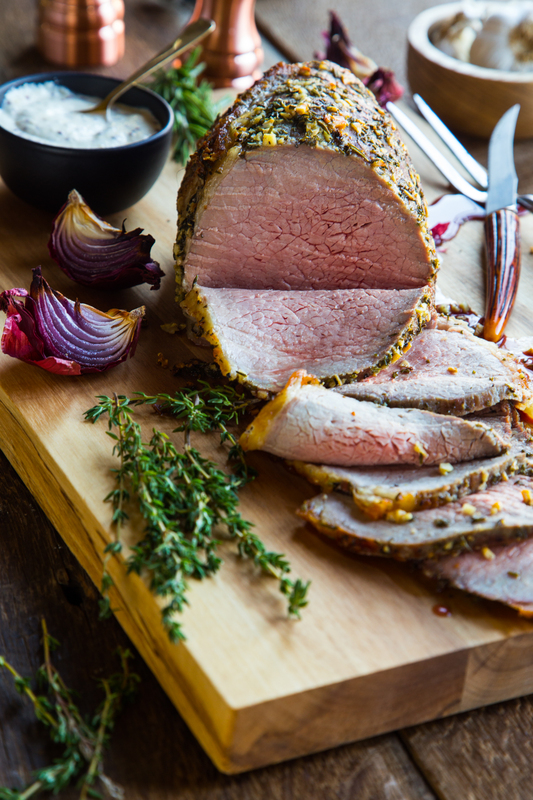 Unwrap roast and place on a rack in a roasting pan. Preheat oven to 450°F. Cook roast for 15 minutes. Reduce oven temperature to 325°F. Cook roast for an additional 1 hour and 10 minutes. Remove roast from the oven and tent with foil for about 10 minutes before carving. Mix mayonnaise, horseradish, and dijon mustard in a small bowl. Serve with roast beef. 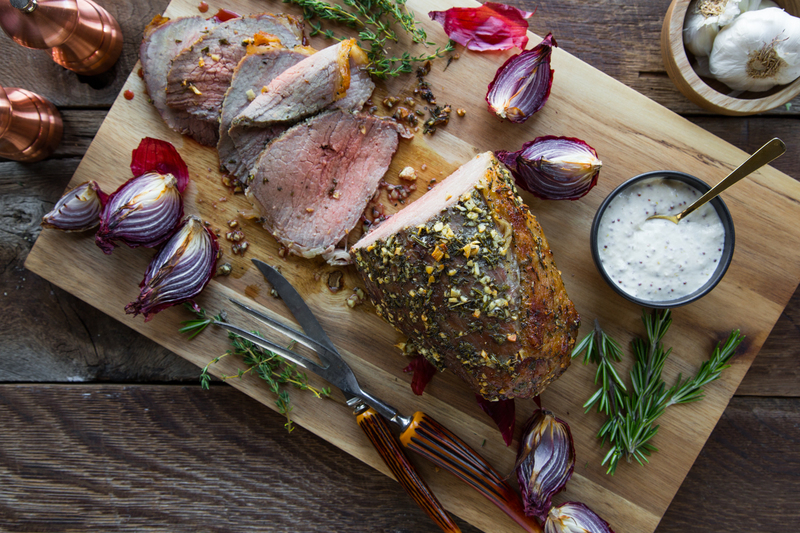 If cooking a different size roast, consult the Certified Angus Beef's Roast Perfect app for cooking times. 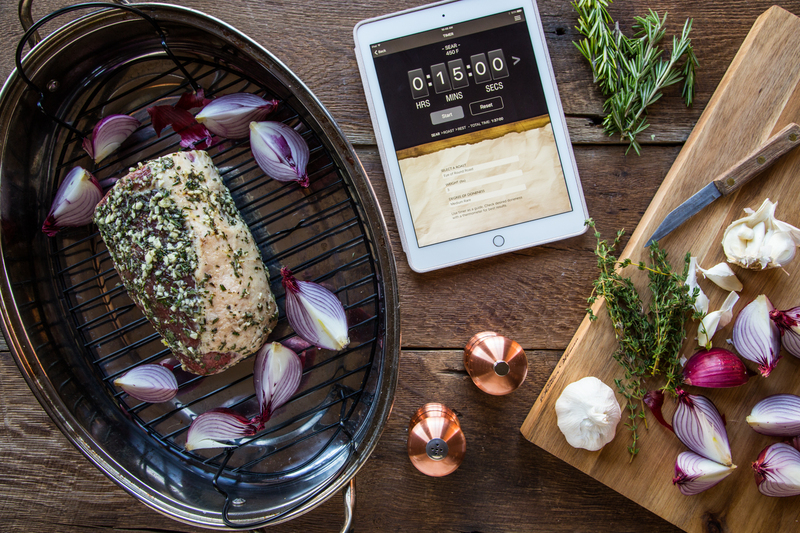 Just select roast, size and desired doneness in the Roast Perfect Timer section of the app. Beautiful photos and we’re so happy to hear you love Roast Perfect! Thanks for sharing your experiences. We hope you can visit again some time! Happy Thanksgiving to you and yours. Thank you so much! I hope you all have a wonderful holiday season! !